7:05, FSN. James Shields v Felix. Wow.. just as we get a hit, we hit into a DP and give Shields a 4-pitch inning. How many DPs is that for the game? 5? Man, the Rays [baseball skill] is just disastrously bad. Hmmm, Manny’s not in the lineup, you’re right. Red Sox slugger Manny Ramirez continues to inch closer to game mode, as evidenced by the batting-practice pitches he hammered well over the Green Monster before Friday night’s game against the Yankees. However, Red Sox manager Terry Francona doesn’t expect Ramirez to be back in the lineup for this weekend’s rivalry showdown….Friday marked the 16th consecutive game that Ramirez was out of the lineup due to the strained left oblique he suffered against the Yankees on Aug. 28. OK, so no chance of a hilarious highlight on SportsCenter tonight. Feeeeeeeeeeeeeeelthy slider, no less so because it came against Jonny “Flyswatter” Gomes. Wow, the Sox just choked. At the rate we’re going, we might pass their game despite starting 3 hours later. No sliders in the Gomes at-bat, Jim – he went curve, change, change. The first change-up was actually a meatball that Gomes swung through, but the curve and the strikeout change-up were nasty. Oh and the triple was nothing special. Hit into the rightfield corner. Just keep playing your game Seattle… ignore the Yankees score. Win, and that is all you can do. There’s a case where HD really helped see what happened. … I just looked at the gameday for the Red Sox/Yankees game. I hate the Yankees so much. So very, very much. …. wow. Damon, Jeter, Abreu — double, single, double. All off Papelbon. its not over yet… There’s still time for them to lose. I keep glancing over at the TV screen and thinking the Rays are Mariners. From a distance, their road grays look exactly like ours. Felix day is always amazing. 66 – agree, and TB has the dark top on white pants at home, too. #69 That’s a no. Those Yankees have a grittiness about them that only a veteran team like them could. So much for the Yanks choking. They pulled the same thing on Boston tonight that we pulled in last nights game. Why was Ichiro so shallow? Ok, it appears that Velandia has a .212 slugging % for his career, but I still think Ichiro was too shallow. A full 8th of shields pitches have come in that last Kenji at bat. Why are players always due to hit? I think you mean “than.” I like him as more than a friend too, if “as my baseball hero” counts as more than a friend. Well, if we can’t win tomorrow, we aren’t going to win a game in this series. HoRom versus Kaz is such a lopsided matchup, it almost seems like a game the Rays will lose. Isn’t being “due” merely another way of talking about regression to the mean? I’ll take it! It’s a win! Go M’s! Nice to see the M’s try so hard to beat a crappy team. Well, a pretty cool win. Felix was terrific. When the worst part of a game is Niehaus’ spontaneous recital of the poem ‘Baseball’s Sad Lexicon’, in full eulogy voice, I’ll take that. As long as Mariners win, after that crappy run, I’ll take it. We gain a game on the angels, not that it matters. But funny to think, if Mariners win the next 2 games and angels lose the next 2, they would be only 5.5 games back, then if they could hold/gain ground in oakland, then they could have a chance at the AL West. Lol, being a little too optimistic. Sorry. Mac slept on the decision whether or not to start Weaver. Guess what he decided? Yeah, I’m not surprised either. Mac the whole world knows, and it is not that he is better. when did the rally jig begin? not that I am complaining, really– it worked, it stopped the asses down the way who kept trying to start the wave in a 1-1 nailbiter, and it is better than tired film clips. and when did the ferry appear in the outfield above the out of town scoreboard?? not the out of town scoreboard– the hand-operated scoreboard. 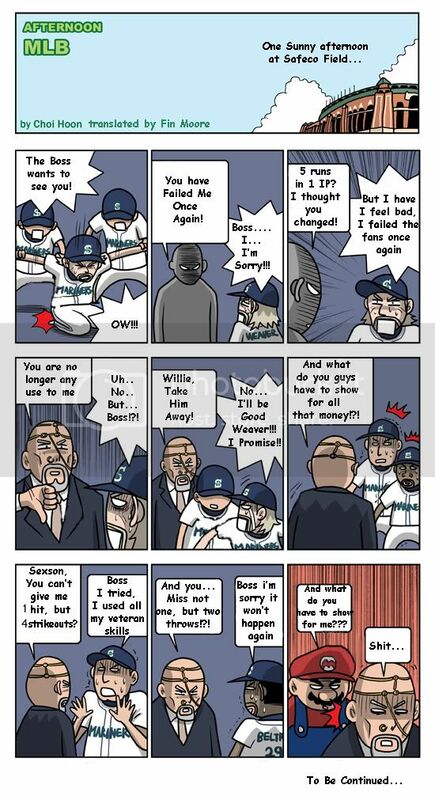 I was so ready for this Mariners season to be over and move on to the already-over ‘Blazers seasons. Great choice of teams there. Less than 100 comments on a Felix day thread has to be a record low. No. 21: the point of the comment about Ron Paul was not to discuss politics, but to point out the absurdity of No. 13’s prior comment that the Mariners still have a chance to win the wild card. 91: And what’s sadder yet is that half the comments were not even about Felix’s decent performance, but rather that Yanks-Sox game. Did anyone else see Eric Hinske take out Posada at home plate a couple minutes ago? Posada had just received the throw and Hinske blasted him in the head with his left shoulder and upper arm. It was brutal, but Posada stayed in there. Sox have now opened up a 5-1 lead.